Facial cleansing brushes are a great skin care tool to have to add an extra something to your cleansing routine. It helps lather up your facial wash, gently exfoliate, and deep cleanse the skin to reveal a natural and bright glow. There are a lot of facial cleansing brushes available in the market — from electric ones to manual exfoliating brushes. While the electric brushes are a bit pricier, they do make up for it by being extremely effective and easy to use. If you’ve never tried incorporating a facial cleansing brush to your skin care routine and would like to know how to properly use one, check out the video at the end of this article. Feel like you want to give facial cleansing brushes a try? Beauty Shortcutips compiled some of the top facial cleansing brushes available in the market for you to choose from. We have a combination of electric facial cleansing brushes and non-electric ones to help you decide which one you like best. Read about each product, their pros and cons that we’ve compiled to make the decision of which one to take home a lot easier. What Makes an Awesome Facial Brush? It also has different bristle sizes meant to be used on different areas of the face for maximum cleansing and effectiveness. The varying intensities also allows you to customize your use depending on what level of exfoliation and cleansing you’re currently after. Unlike the other brushed on this list, the FOREO LUNA Mini is rounder in shape and does not have a handle. 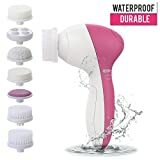 This is one of the most popular electric facial cleansing brushes in the market due to its handy shape, wide variety of replacement brush heads, and excellent cleansing ability. The Clairsonic Mia 2 uses a patented micro-massage motion that works within the skin’s natural elasticity to deeply cleanse the skin and unclog pores. It helps you achieve a cleanse that’s 6x more effective than just washing with your hands. The best thing about this kit is it has everything you need to get started with your facial cleansing. It includes one bottle of Olay’s ProX Exfoliating Renewal Cleanser and two AA batteries to get your electric brush going. It’s also convenient since you won’t have to worry about bringing a charger whenever you pack this with you. Just pop in two batteries and it’s good to go. The best thing about kits is that they provide you with a variety of uses and tools to help you achieve your skin care goals. This facial cleansing brush kit from Lilian Fache comes with four interchangeable brush heads, each with a specific function. 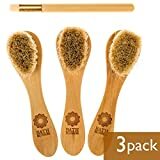 There’s a large brush head for the body, a medium brush head for normal cleansing and exfoliation, a dense brush head for a deeper and more concentrated clean, and a pumice stone for softening tough skin and callouses. This extremely customizable facial cleansing brush system is great for those who want an all-in-one set that includes seven types of brush heads - each with a specific use. There are exfoliating brush heads, facial massagers, soft-bristle brushes, etc. This set has all you could possibly need in a facial cleansing brush system and more. 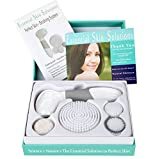 This set from Galvanic Facial Machines may have less brushes than the PIXNOR Brush system, but it has one large brush head that can be very useful for cleansing and exfoliating your body as well. It’s simple, easy to use and store. This is one of the only manual cleansing and exfoliating facial cleansing brushes on the list, but it’s here for a good reason! The product is made with soft, natural bristles that are great for sensitive skin. The bristles are strong, flexible, and feels great on your face! It’s a great alternative for those who don’t want to spend too much on an electric brush. Also, the small nose brush is great for preventing blackheads and clogged pores around the nose area. This is yet another manual exfoliating brush for those of you who like to keep things simple. Unlike the Bath Blossom Face Cleansing Brush, this one is made of synthetic, non-slip material for easy handling and use. It’s a two-faced brush with one side used for lathering and getting rid of excess oil and dirt, and the other side with shorter bristles used for exfoliating and unclogging pores. It’s simple, easy to use, and a lot cheaper than an electronic facial cleansing brush. What Makes an Awesome Facial Cleansing Brush? Not all facial cleansing brushes are made the same. Some brands possess the right set of traits that makes them a worthy investment. At Beauty Shortcutips, we’ve summarized the three must-have traits of a good facial cleansing brush. With all the amazing facial cleansing brushes out there, you need something extra to make your product stand out and make it worth the splurge - let’s face it, facial cleansing brushes don’t always come cheap. A multi-functional facial cleansing brush with interchangeable brush heads, adjustable intensities, etc. would be a better investment given that it has more uses. Of course, just being customizable and multi-functional isn’t enough to make a facial cleansing brush brand worth spending on. It has to be effective and of good quality as well. For those of you who travel a lot, having a facial cleansing brush that you can bring with you without needing to pack in a bulky charger can make life so much easier. 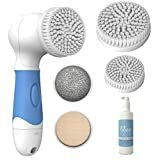 If you don’t really move around a lot and just need a good facial cleansing brush in the bathroom, it’s still good to check for reviews on how well a product keeps its juice. This only applies to electric facial cleansing brushes but it’s still an important thing to check before making a purchase. Last but definitely not the least, a facial cleansing brush should be able to effectively clean and exfoliate - since that’s pretty much what they’re made for. There are a few brushes on the market that are great at cleaning and working up a lather, but are too soft to effectively exfoliate the skin. A good facial cleansing brush should be able to do both to make it worth the spend. 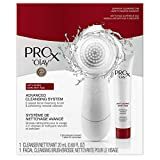 After carefully assessing each product, the Olay ProX Advanced Cleansing System with Facial Cleansing Brush wins the top spot as the best bang-for-buck facial cleansing brush on the list. It may not be as customizable as the other products, but it’s definitely one of the most effective cleansing and exfoliating brushes due to its sturdy but gentle bristles. 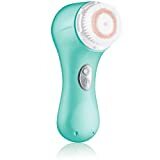 It’s also one of the most affordable electric facial cleansing brushes on the list, making it a great starting product for those looking for their first facial cleansing brush.